We've reached a bit of a backup and the time for cleaning out the fridge, pantry, and freezer has come. I suspect that next week may be largely focused around cleaning out some of that nonsense. The first course for tonight was something I called "picnic salad" which basically means, everything leftover from various recent picnics. 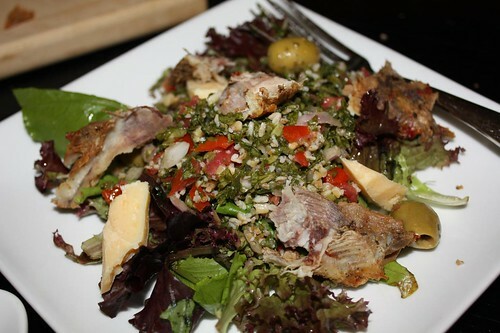 I used the last of our mixed greens, tabouli, Mahon cheese, olives, and some bits of the Peruvian pork from Monday night. The main course was roasted tomato ravioli with saffron dough from Severino Pasta (and, more recently, our freezer). 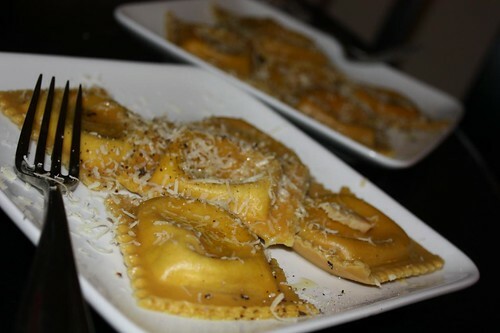 I drizzled the ravioli with a little olive oil and shredded some more Mahon over the top. 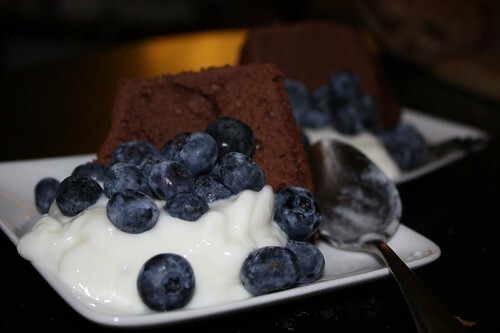 For dessert we enjoyed some of the farm blueberries with a little yogurt and some chocolate angel food cake that has been outstaying its welcome in our freezer for some time. What goes well with chocolate and blueberries? Well, watching the Tour de France. Especially when all the riders are bickering like a bunch of little girls and the emotions run high. I'm not sure if bike riders were always this much of a bunch of sissies or if it's just been amplified by Twitter. Either way they're a bunch of little sissy la-las.